and Chinese projects of J-20 and J-31. the aircraft in terms of the fifth-generation fighters cooperation. so far to 37 units), Australia ordered 14 aircraft (the government also confirmed the will of buying further 58 units, Australian plan assumes the acquisition of approximately 100 fifth-generation fighters), Norway confirmed the acquisition of 16 units (from 52 planned), Turkey is going to buy approximately 100 F-35 (the purchase of 2 units has been confirmed so far). Denmark and Canada are going to make a final decision concerning acquisition of F-35 (or starting an open bid) in the coming months. There are also some countries interested in acquisition of F-35 outside of the JSF participants, such as Israel (19 ordered, the total number of the new aircraft is estimated at 75 units), Japan (42 F-35A) and South Korea (purchase of 40 F-35A confirmed). Despite the growing costs of the JSF program, as well as no credible data concerning future life cycle cost of the F-35 aircraft, the majority of countries interested in the acquisition of these multirole fighters is looking for successors of currently used 4th generation aircraft. However, as far as the United States Air Force is concerned, new stealth fighters are intended to also replace ground-attack A-10 Thunderbolt II aircraft, dedicated to close air support missions. Disputes regarding limited close air support capabilities of the F-35 aircraft and attempt to withdraw ‘Warthogs’ from USAF are being broadly commented by American commanders. In February 2015 Gen. Herbert J. Carlisle (commander of Air Combat Command) said that gaps in operational capabilities of the United States Air Force deriving from withdrawal of the A-10 aircraft should be taken into account in the military analyses. Furthermore, the Air Force should consider research on a completely new construction of the next generation close air support aircraft. The development program of the new stealth multirole combat aircraft is important both for the United States and their allies not only due to ageing fleet of aircraft of these states. It is worth emphasizing that the most powerful rivals of the United States in terms of military technologies – Russian Federation and People’s Republic of China have achieved significant progress. These are the only countries that have finished the conceptual phase and the specific solutions are currently being tested on prototypes of the new aircraft. 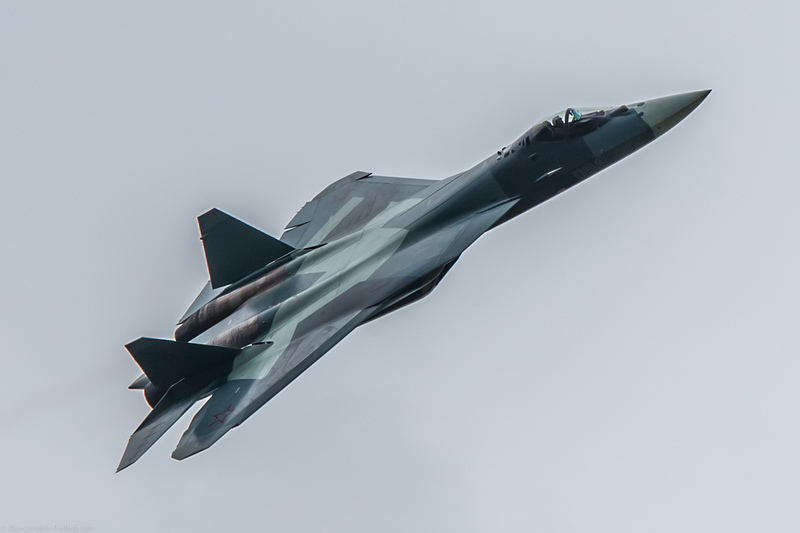 The prototype of the T-50 stealth fighter, manufactured by Russian Sukhoi Company, took to the skies on 29 January 2010 in Komsomolsk-on-Amur. The Sukhoi’s construction is a classic air superiority fighter that combines ground and maritime attack functions as well. As with the Joint Strike Fighter Program, the PAK FA (Russian: Perspektivny Aviatsionny Kompleks Frontovoy Aviatsii) is burdened with the difficulties connected with the technologies applied inside the fighter (the most severe accident took place in June 2014 – T-50 aircraft caught fire during landing at Ramenskoye base near Moscow). As of February 2014 the first T-50 aircraft was sent for testing by the Russian military. According to the Russian military modernization program 2011-2020, the Ministry of Defense of the Russian Federation plans to acquire 55 T-50 units by 2020. The Ministry of Defense is assumed to buy 8 T-50 units per year over the period 2016-2018 and 14 aircraft in 2019 and 2020 respectively. However, in March 2015 Yuriy Borisov (Deputy Minister of Defense responsible for arms procurement) announced that the order will be reduced to 12 units (1 squadron) “due to economic considerations”. The decision concerning further procurement will be made after introduction of the first operational squadron of Sukhoi T-50. According to the Russian Ministry of Defense the factory from Komsomolsk-on-Amur is able to start large-scale production in 2016. It is worth emphasizing that current version of T-50 fighter is not based yet on target components. All prototypes as well as units under construction are equipped with serial Saturn AL-41F1 (izdeliye 117) engines due to ongoing works on new generation engines (izdeliye 30) that are intended to end in 2020. Russians have high expectations regarding Sukhoi T-50 as a new export product of their military aviation industry. The most significant potential client as well as the cooperator in the program is India. According to the Indian press, deadlock in negotiations with France concerning the acquisition of 126 Dassault Rafale multirole fighters could hasten Indian-Russian debate on a common fifth-generation fighter aircraft (FGFA) that is intended to be based on Russian PAK FA. An ageing fleet of the Indian Air Force (which is still based on obsolete fighters such as MiG-21M/MF, MiG-21Bis and MiG-21Bison) needs decision about its modernization. Therefore the Indian government is going to spend up to 25 billion USD on FGFA program. the Chinese arms industry is dependency on Russian supply. Therefore the acquisition of the Russian multirole Su-35S fighters could be perceived as a chance to improve combat capabilities of the Chinese Air Force and additional impetus for military aircraft industry of the People’s Republic of China. The J-20 fighter manufactured by Chengdu Aircraft Corporation, which construction is based on canard wing configuration, has generated a lot of attention of Western media and analytical institutions. As opposed to the J-31 aircraft, the Chengdu’s fighter has not been publicly presented. The information revealed so far (mainly pictures) suggests the existence of 6 prototypes, 2 of them were introduced in November and December 2014. According to the latest observations of IHS Jane’s analysts in comparison to the previous variants the changes include the airframe construction as well as the general equipment such as smaller canards and vertical stabilizers, new Electro-optical Targeting System (EOTS) and different profile of a fuselage. Progress of Chinese engineers is being monitored closely by the Pentagon, especially in the context of industrial espionage and theft of new American technologies. The main target of the cyberattacks was Lockheed Martin Company as well as its subcontractors in the United States and other states participating in Joint Strike Fighter Program. Development of capabilities of the Chinese arms industry concerns of neighboring countries involved in territorial disputes with People’s Republic of China such as Japan, Philippines and Vietnam. the region – in 2013 countries of Asia-Pacific region increased their budgets about 4,7 per cent in comparison to the previous year. According to the International Institute for Strategic Studies in London Chinese military budget is three times higher than Indian, furthermore it is larger than combined military expenditures of Japan, South Korea, Taiwan and Vietnam. The potential threat of the Chinese Armed Forces (People’s Liberation Army) is recognized by its neighbors – as proof of this Japan and South Korea have confirmed orders for F-35 fighters. As a symbolic answer to the official presentation of the Chinese fifth-generation FC-31 during Airshow China 2014 it can be perceived a visit of American F-22 Raptor fighters (from Joint Base Elmendorf-Richardson in Alasca) in Japanese Air Base Kadena. Common American-Japanese training missions were undoubtedly shows of power of the United States. Similar activities took place in South Korea during Foal Eagle exercises. The other element to consider is an assessment of the Russian PAK FA program. According to Lt. Gen. Dave Deptula, former Deputy Chief of Staff for Intelligence, Surveillance and Reconnaissance of the USAF, the aerodynamic design of Sukhoi T-50 surpasses achievements of US engineers. According to Lt. Gen. Deptula, Russians focused especially on improvement of maneuverability of the T-50 aircraft, however the stealth capabilities are of secondary importance. It has to be emphasized that on contemporary battlefield the aircraft armament system as well as tactical data systems – these factors are the most important in the context of contemporary battlefield and they will decide about real combat potential of Sukhoi T-50. and the Indian government expressed doubts about aircraft’s current equipment and its combat capabilities. Both Russian and Chinese aircraft are not market competitors for Joint Strike Fighter Program – PAK FA, J-20 and J-21 are intended to be an offer for countries without an access to the Western types of armament. It has to be stressed that contrary to PAK FA, any assessments of real combat capabilities of the Chinese fifth-generation aircraft has to be seen as speculation. According to the IHS Jane’s information the People’s Republic of China should have 24 J-20 fighters and the aircraft will achieve Initial Operating Capability in 2017-2018. Russian PAK FA is not a threat for Western modernization programs mainly due to limited orders. However, it has to be emphasized that an introduction of the stealth fighters to the Russian Air Force implies suitable measures of the European countries. Currently the most significant threat to Polish Air Force seems to be multirole Su-35s aircraft and Su-34 tactical bombers able to carry various types of armament (such as Kh-55 and Kh-59 cruise missiles). Plans of the Polish Ministry of Defense should include further modernization of the F-16 Block 52+ aircraft to the standard named as F-16V that would include integration of the Polish F-16s with modern equipment such as active electronically scanned array (AESA). It is also necessary to launch a debate concerning new perspective multirole fighter for the Polish Air Force.